We spent over 40 hours researching and testing 10 different kinds of digital pianos and found that sound quality, ease of use, and brand reputation were most important. The Yamaha Digital Piano scored high marks in all areas and is our top pick. This 128 note, polyphony keyboard has an 88 note, GHS action that gives you the ability to be a one man band. This piano works great with computers, smartphones, mixers and other tools to provide you with excellent sound. It is a great fit for beginners as well as more seasoned players and will provide the kind of sound you are looking for from a digital piano. Despite being named in a way that might begin to suggest otherwise, the digital piano bears much less resemblance to traditional, acoustic pianos than you may at first think. While picking out the right acoustic piano all comes down to acquiring a model which emits the type of sound you want, this is not so much the case with electric pianos, likely due to the wide range of features found from one model to the next. As such, digital pianos don’t only find themselves replacing their acoustic counterparts, but can even go so far as to give their owners a more personalized experience than any acoustic piano ever could. This is, of course, assuming you buy yourself the right piano to begin with. If you’ve yet to own your first digital piano, you might be surprised to find that it may actually be more beneficial than a standard piano, even when used in a situation where an acoustic model is easily accessible. Simply put, the digital piano just has many more capabilities. Of course, the professional pianist will likely opt out of the use of digital models through a sense of tradition, though the versatile musical artist who would expand their horizons beyond the playing of a piano would likely be much more suited toward those of a digital variety. It’s up to you to know which musician you are. That being said, let’s find out which digital pianos are worth your money to begin with. The DGX650B is a digital, 128-note, polyphony keyboard with an 88-note, GHS action. Its sole purpose seems to be to give you, the owner, the power to be your own one-man band. This is apparent not only through many of its features (which we will touch base on in a moment), but through the sheer power the piano possesses, allowing you to get a variety of full, loud sounds playing in conjunction. Perhaps its most exciting feature in this regard is its ability to work together with a variety of different tools (computers, mixers, smartphones, etc. ), which removes many of the limitations you may usually find yourself facing as a one-man band through increasing your capabilities as an artist. Jam sessions are also a breeze through the piano’s induction into the You Are The Artist series of Yamaha digital pianos. Simply put, pianos which fall into this series have songs programmed into the unit to which you can play along with, mix or edit (depending on the additional equipment you may choose to use in your setup). Because of this, the piano is also great if you are a beginner. All in all, the Yamaha DGX650B removes many of the limitations inherent in playing music by yourself. Whether you’re a beginner or an advanced pianist who has been composing music for years, it’s hard not to see the value in this model. This digital piano comes with two headphone jacks, quarter-inch left and right outputs and a Tri-Sensor Scaled Hammer Action II keyboard. As its name clearly suggests, if you buy the Casio Privia bundle, you will get more than just a digital piano. 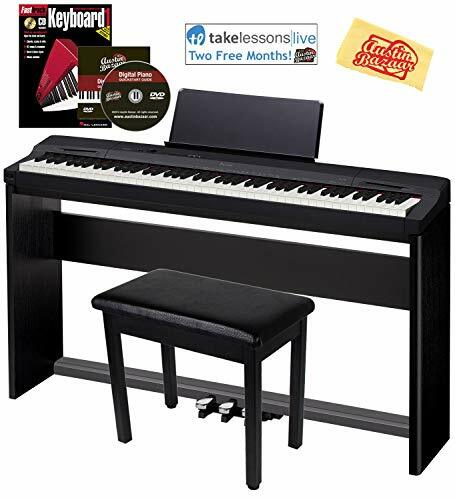 As a whole, the purchase includes a digital piano, an SP-33 pedal system, a cleaning cloth, a piano bench, an instructional book and an instructional DVD. This makes it great, no matter your current skill level. Even if you find yourself too advanced to be bothered with the instructional book and DVD, it’s hard not to appreciate the piano itself. Perhaps the best and most notable feature of the piano – which serves to set it apart from others – is the feel about it. If you love the look and the touch of the classical piano, you will likely feel somewhat closer to home with the Casio Privia. While this particular piano may not be as great as the above Yamaha for more versatile musicians and composers, it’s certainly superior if you’re solely focused on playing the piano and nothing else. This is achieved through its great feel, look and sound. The Casio Privia is a line which has been in existence for some time now and continues to be successful due to the above factors. The Yamaha YPG-535 is an 88-key digital piano with Graded Soft Touch and a sustain pedal whose priorities seem to revolve purely around practicality. While it may not come with too much in the way of fancy, advanced features, it does an excellent job of covering all of the basics and is likely the very best digital piano you’ll be able to get your hands on if you’re the type who appreciates a good bang for your buck. Perhaps its most notable features – outside of its great sound – are found within its built-in LCD screen. The screen in question displays lyrics, notes and even chords. It also has a great melody mode. The above features may not sound overly exciting if you happen to be an advanced pianist, but are perfect if you are just starting out. Either way, the features in question seem to be rather benign in terms of their effect on the piano’s price, ensuring you do not pay for features you know you won’t end up using. Simply put, the Yamaha YPG-535 is great for all pianists, no matter your goals or skill set. This makes it one of the safer purchases you could make in the realm of digital pianos. As you can see, there is no universally “best” digital piano. This is due entirely to the fact that your needs may be completely different than that of another pianist. Are you a beginner? Are you looking to branch out your musical horizons beyond that of the piano? Or are you simply just looking for the best bang for your buck? No matter your current situation, goals, level of expertise or preference, there is always a digital piano available to suit your needs. I will; however, note that one of the above digital pianos is likely to suit your needs. Which one you decide on really all comes down to you. The Yamaha DGX650B is an excellent choice if you often find yourself playing music alone, though would like a little more in the way of backup. 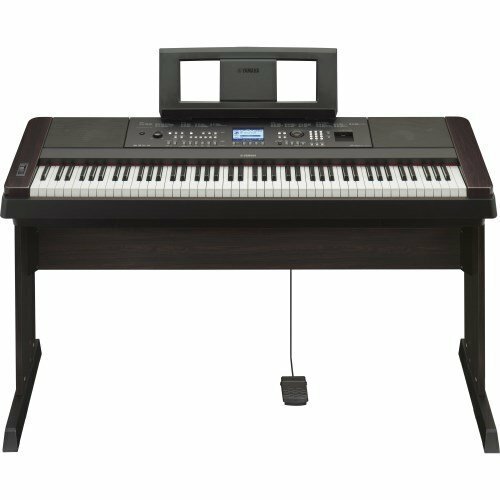 The Casio Privia PX-160 is great if you would prefer an experience closer to that of a classical piano and the Yamaha YPG-535 is the perfect choice if you’re a beginner or you happen to be looking for a great value. For more information on picking out the right model for you, see our buyer’s guide below. While such pianos can be a great addition to the musician’s arsenal, picking out the right model isn’t always so easy. Unlike the guitar, the classical piano or the grand piano, there aren’t a whole lot of “classics” available in the digital piano market. This is likely due to the fact that it is a somewhat newer technology which varies greatly from model to model in terms of the features offered. As such, this review will aim to not only offer you three examples of the very best digital pianos available on today’s market (based on a criteria of included features, sound quality, practicality, technological advancement and cost-to-quality ratio), but try to illustrate just what it is that makes a good digital piano a good digital piano in the first place. We will do so through covering the different features you may look for in your piano of choice to most suit your goals, as well as common features to look out for in pianos as a whole, ensuring the model you end up getting is not only perfect for your needs, but is of a high degree of quality as well. The piano you decide to go with – whether or not it appears in the above list – is going to vary greatly depending on your needs and skill level. There are a few things to consider before settling on a certain model. What do you need extra? Many digital pianos come with features which are aimed at helping you grow your talents through play-along songs and the display of notations. Do you plan on composing full songs? While many songs have been composed solely through the use of a pen, paper and an acoustic piano, many of today’s digital pianos have tools aimed at streamlining the process of musical composition, such as the ability to plug other devices into your piano and the ability to record them all in conjunction. What type of sound are you looking for? Often, digital pianos will offer you the use of a variety of different sound banks. Said sound banks can replicate the sound of grand pianos, classical pianos, strings, organs and even bass guitars. Know what sounds you’d like to have at your disposal before settling on a digital piano. At the end of the day, a piano is a piano. If you’re merely looking for some keys to press which go on to emit a sound, it truly doesn’t matter which piano you pick. However, you’ll notice after a bit of inspection that there are several different types of digital pianos, each with their own pros and cons. Do you know which type of digital piano is most likely to suit your needs? Portable Digital Pianos – These are most likely suited toward you if you have a knack for performing on short notice. While they may not be as heavy-duty in stature and may not come with a variety of features, they’re great for laying down a simple piano track in public areas or at a friend’s house with ease. Synthesizer-Piano Hybrids – With a bit of searching, you’ll find that there are some digital pianos which come with a few basic features you might expect to find in a digital synthesizer. These include the ability to work with multiple devices as well as create simple beats after the touch of a button. Beginner Digital Pianos – There are a wide variety of digital pianos that come with a wide variety of learning tools which are aimed at helping you along your initial journey as a budding pianist. Often, these will have LCD screens, play-along songs and even included books and DVDs which lay down much of the music theory foundation you will need to excel in the instrument of your choice. While each piano caters to a specific group’s needs through the use of a multitude of different features, there are a few features you should expect to find in any piano. Let’s take a look at what distinguishes a good piano from a cheap piano. A Music Stand – While this may sound obvious to some, it may go overlooked if you’re a beginner. Although music stands can be bought separately from digital pianos, these will often prove harder to work with in the heat of the moment. Eighty-Three Keys – It can be easy to forget to take note of how many keys a piano has. Typically, you want an entire eighty-three keys, as this is the typical layout found in traditional pianos. While such an amount of keys may not always be necessary, it will prove to keep your options open, no matter where your musical adventure may take you in the long run. If this many keys aren’t an option, the general rule of thumb should be that more is better. The very most important thing to keep in mind when shopping for a piano is whether or not any given model was made for you. It doesn’t matter what Elton John plays and it doesn’t matter what your music teacher plays. At the end of the day, the best piano is the piano made with your specific needs in mind. When shopping, keep in mind your level of skill, the type of music you wish to produce and the type of sound you’re looking for. After deciding any given piano was made with your demographic in mind, go through the standard-but-short checklist of features you should expect in a piano. How many keys does it have? Will that amount be enough? Does it come with a music stand? Through following the above recommendations, picking out the best possible piano for you should be a piece of cake, no matter your price range, level of skill or future musical goals.